When using Peachtree to manage your business finances, remember the credit and debit rules; use keyboard shortcuts to work easily in Peachtree; and get to know the toolbar buttons used the most. If you have a question about using Peachtree, or accounting, use the variety of internet resources available. To increase an Asset account, DEBIT it. To decrease an Asset account, CREDIT it. To increase a Liability or Equity account, CREDIT it. To decrease a Liability or Equity account, DEBIT it. To increase a Revenue account CREDIT it. To decrease a Revenue account DEBIT it. To increase an Expense account, DEBIT it. To decrease an Expense account, CREDIT it. Peachtree speeds up your accounting tasks — and keyboard shortcuts speed up Peachtree. 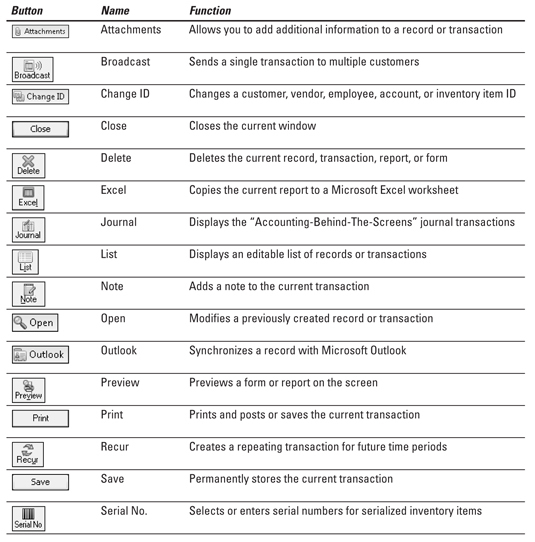 Get to know these Peachtree key combinations ( or keyboard shortcuts) and their functions to help you quickly and efficiently complete your business accounting.